When the weather turns cold, kids face new dangers of which adults need to be aware. Keep young ones safe, warm, and healthy through the coldest months by following a few simple safety tips indoors and out. Understanding the basic risks and how to minimize them can help parents protect their children from the ravages of winter while still enjoying its beauty. Winter weather can be dangerous in several ways. Exposure to extreme cold can cause hypothermia and frostbite. Lethargy and overheating can occur with limited outdoor activities. Bacteria and viruses spread quickly and easily when people are confined to smaller spaces for longer periods. Storms can leave people stranded in cars or outdoors without power and heat or unable to travel to necessary locations. Outdoor sports can cause serious injuries. With careful planning and supervision, children can enjoy the fun and freedom of playing indoors or outdoors on chilly winter days without substantial risk. Adults caring for children in the winter should take extra care. Check your child's body temperature and physical appearance frequently. Provide a variety of activities to promote physical movement. Do safety checks with heating sources and other electronics. Understand the hazards of winter and how to prepare for them. Babies and toddlers are at high risk for physical ailments and injuries resulting from winter weather hazards. Children in this age group rely on caregivers to recognize their needs and keep them safe. There are two main reasons babies and toddlers have a heightened risk during cold weather months. Most children in these age groups aren't able to identify physical and mental symptoms accurately or verbalize these discomforts. Essentially, they are unable to recognize the need for help or to ask for it. Their bodies are physically less able than adults according to the American Academy of Pediatrics. Babies and toddlers are not able to regulate their own body temperature or shiver as effectively as adults. Newborns are especially prone to hypothermia because of their physical makeup. It is up to parents and caregivers to be prepared and vigilant in the care of babies and toddlers. Avoid using blankets while infants are sleeping as this can help prevent SIDS. Instead, clothe them in warm, one-piece sleepers. Wash hands frequently to avoid transmitting disease. Don't bathe children every day and use perfume-free baby soap and lotion to keep skin moisturized during dry months. Use a humidifier to combat the effects of dry air. Place it out of reach for the child and far enough away from her sleeping area so she cannot feel the mist on her skin says Humidifier Mentor. If the windchill is below 10 degrees Farenheit, Parents.com recommends keeping babies and toddlers indoors. Do not allow babies and toddlers to go sledding alone or with an adult. If a child's temperature drops below 95 degrees Farenheit, the Center for Disease Control suggests seeking medical attention immediately. The best methods for temperature readings in this age group are rectal or temporal artery readings. While there are not many safe outdoor activities for children in this age group, there are some activities that can be beneficial on warmer winter days with temperatures above 40 degrees Farenheit. Expose toddlers and babies to fresh air and sunlight, which can help with development and warding off illness. Bring snow indoors for children to explore with gloves in a sensory bin. 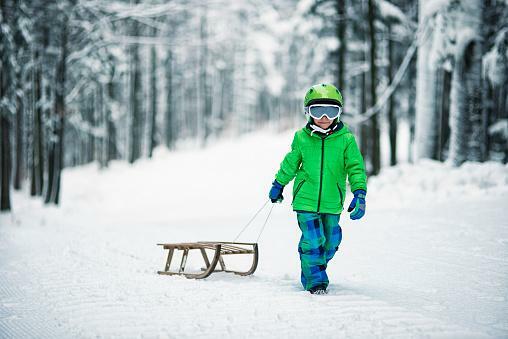 Pull toddlers on a sled with a built-in seat that has a buckle; make sure they are wearing a helmet. Rain, snow, and ice can pose many problems for caregivers with babies and toddlers. While it is ideal to keep babies and toddlers indoors during inclement weather, it is not always possible. Following general safety measures can limit the risks posed by precipitation. Spread ice melt, salt, or sand on walkways. Check the functionality of gutters and clear them of icicles regularly. Invest in snow tires for your vehicle. Keep safety supplies handy in the home including flashlights, blankets, and extra food/water. If you must take a baby outdoors in the rain or snow, even just to put them in the car, dress her in a waterproof outer layer you can remove while she is in her car seat. When carrying a baby or toddler outside over wet or icy surfaces, don't carry anything else so you can focus on stepping carefully and keeping the child safe. Use a tabletop Christmas tree instead of a full-size one. Use battery-powered light strands to keep electrical outlets clear. Hang decorations out of reach of children. Use only non-breakable decorations, particularly avoiding glass. Avoid small bows or other embellishments when wrapping gifts for this age group. As children become independently mobile, new considerations arise relating to winter weather. Young children can handle more exposure to cold than babies resulting in physical concerns such as chapped lips, dry air nosebleeds, strained muscles, and broken bones. Parents and caregivers who are aware of the risks and prepare by planning ahead, checking weather updates frequently, stocking up on essentials, and putting together a winter car emergency kit will feel confident in their child's safety. Taking infant/child CPR and first aid courses is also helpful. Simple preventive measures can protect young children. Use perfume-free soaps and lotions. Talk to children about the dangers of winter weather. Dress children in layers and instruct them to come indoors when they are wet or start feeling cold. Don't allow young children to help with snow shoveling, which can strain their muscles. Playing outside during the winter months can have great health benefits. The new surroundings offer opportunities for cognitive and physical development while supporting healthy bodies by providing fresh air and exposure to vitamin D. As these children can spend more time outdoors and explore the fun of winter, be sure to keep them safe. Feed children a healthy snack before outdoor play; the calories provide energy. Dress children in warm layers including a waterproof outer layer in bright colors. Use a weather guideline chart to determine if temperatures are safe for outdoor play. Generally, temperatures in the 30 to 40 degree range are most suitable, while temperatures under 20 degrees are dangerous. Set time limits to outdoor play. Depending upon the temperature and wind chill, 15 minute blocks are ideal in comfortable weather conditions. Remind children to stop for drink breaks often. Stay away from snowbanks where children could be hidden from vehicles like snowplows. Discourage building snow forts and igloos that could collapse. Young children can enjoy more outdoor sports like ice skating, sledding, snowboarding, and skiing. Consider the following to keep them safe. Ask someone qualified to provide step-by-step instruction and supervision before allowing children to try on their own. Check that the area used is clear of hazards like rocks, large bumps, or thin ice. Require the use of helmets and goggles. Children under the age of 6 should not ride on snowmobiles. Keeps hands out of pockets. Avoid using arms to brace your fall if it is imminent. If you or your child start falling, lean your upper body forward so you don't hit your head. As children age, more activities are available. The most important thing a caregiver can do is equip children with the knowledge they need to keep themselves safe. 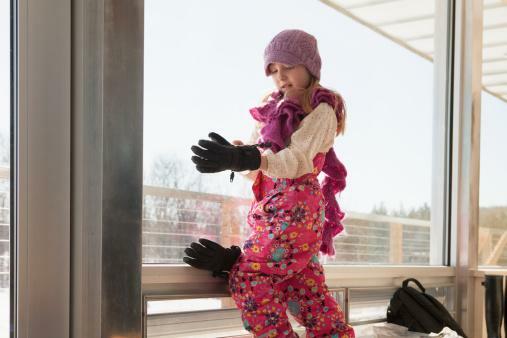 The long days of winter often keep children indoors, which can lead to hours of inactivity. To stay healthy during the winter, consider the following. Eat a healthy, balanced diet that includes fruits and vegetables. Teach children proper hand-washing techniques to kill germs and bacteria or use hand sanitizer, if necessary. Encourage children to cough and sneeze into their elbow area. Keep children home from school and other public places if they are sick. Most schools have policies on absence due to illness, but the general rule is to keep them home for 24 hours after a fever, vomiting, or diarrhea. Ask a pediatrician about the necessity for flu vaccines. Winter sports can be a great way for children to stay active and enjoy colder temperatures, but each sport presents it own unique hazards. These safety tips can help them enjoy sports safely and comfortably. Use proper safety equipment and gear while playing winter sports, including sports goggles and helmets. Engage in safe sports behavior such as following the rules of the game and eliminating horseplay that can lead to accidents and injuries. 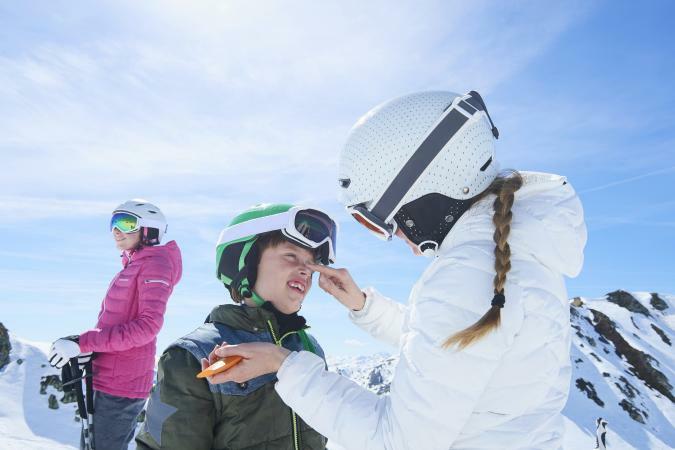 Enroll children in advanced winter sports lessons from a qualified professional, such as figure skating, skiing, and snowboarding, to ensure they learn safe techniques. Play winter sports in safe, approved locations rather than using seemingly frozen ponds, unfamiliar hillsides, or other potentially dangerous locations. Children under the age of 16 should not drive snowmobiles. Encourage the buddy system where children stay within sight of at least one other person at all times. Grade school children have a lot of independence with outdoor play and movement in winter. As they explore slippery surfaces, be sure they know the proper way to walk on ice as listed above. A new problem for this age group will be evaluating visibility. When older children are playing outside in heavy snow, it is easy for them to lose direction. Encourage children to stay near the house, stay calm, look for familiar landmarks, and check in frequently while outside during a whiteout. The dangers of winter weather are just as great indoors as outside for many children. When dressing kids for warmth, consider the following. Avoid clothing with drawstrings or long material like scarves. Dress them in a waterproof outer layer when going outdoors. Dress children in one more layer of clothing than you are wearing. Cover their head, ears, hands, and feet while ensuring they can still breathe normally. Be sure clothing doesn't inhibit their ability to move. Never leave a very young child unattended near heaters of any kind. Put up barriers around large heating units like radiators. Avoid the use of space heaters, especially in a child's bedroom. Don't use candles or open flame as heating sources. Install carbon monoxide and smoke detectors in every major living area and outside every bedroom. Don't leave small children unattended in a running vehicle. Teach children fire safety procedures, including how to spot potential hazards. Taking extra care in the winter months can protect children from potentially life-threatening physical ailments. As new elements arise outdoors and inside, adults should be aware of these changes and how to keep children safe.